NOTE: LIMITED EDITION COMES IN RED COLOURED VINYL. Two years on since his last outing on the label, 'The Follower', Axel Willner puts on his Field suit again to present his sixth full-length effort for Kompakt, 'Infinite Moment' - which sees him striding further across the deeper, richer rims of the hue cycle. In Willner's own words, "the threshold of creating something new had to be broken", as had been done with his past albums, including his acclaimed debut 'From Here We Go Sublime'. On this release in particular "stepping outside of the studio opened up fresh perspectives on the creation of new music" he confesses, and it was the opening cut, 'Made of steel, made of stone' - the first to be finished, that got him into the flux of things, making the "making of the rest of the album easier as I went". Substituting the uptempo vim of his previous pieces for a sense of mind-expanding horizontality, 'Infinite Moment' is an album filled with hope and draped in a diffuse, appeasing light; easing the pain and troubles of the human soul through a lushly forested recital of shoegazing modular, complex textural interplays and solar, atmospheric fractals. The matrix cut 'Made of steel, made of stone' gets the ball rolling on a thumping downtempo note, "a lot slower than the previous ones" as Willner remarks, which he further explains "gives me a lot of hope". "Hope is something I've been missing in the nowadays climate and this album is a relief to me, a type of comfort, like a moment that feels good and you don't want to end." 'Divide Now' is a proper sonic mitosis, engaging the metamorphosis to come; like a larvae pupating and reemerging weeks later from under rough bark in the form of a vividly coloured butterfly - fluttering breaks eventually shedding their skin then making way for a crucially more intimate and hypnotic second chapter. 'Hear Your Voice' propels the lavish, pad-upholstered glamour of its melodic lines in the mixer for a bolder syncopated revisitation of '80s indebted pop harmonics, while 'Something left, something right, something wrong' returns to a flaring post-euphoric daze. Legs numb, mind confused and eyes lost into the greater whole, where nascent stars dance their way across the milky way to the rhythm of samba, and universal loving is no utopia. A more arrhythmic affair, 'Who Goes There' spins out into orbit wildly, fusing stealth acid bass moves with a haunting off-kilter motorik that bears The Field's seal of exclusivity, playing with the listener's mind intensely before the ten-minute-long epic 'Infinite Moment' ushers its listener in a highly immersive final ballet of buzzing chords, trampling drums and all-consuming drones. Syncing the self with its environment in ways never explored before, this album is a direct soul-to-soul transmission, aiming no further than at finding the right balance between contained emotion and an expressive eloquence. No fluff, no bluff - with 'Infinite Moment', The Field goes straight for the heart, stripping bare of all vain and futile attributes to focus on the very essential - He is hopeful, and so are we. 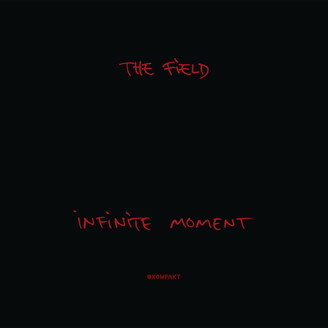 Zwei Jahre nach seinem letzten Album „The Follower“ präsentiert Axel Willner sein sechstes Kompakt-Album als The Field, „Infinite Moment“, um das tiefe, reiche Spektrum seines Sounds weiter zu beschreiten. In Willners eigenen Worten, „musste die Schwelle, etwas Neues zu schaffen, durchbrochen werden“, wie schon bei seinen vergangenen Alben, darunter sein gefeiertes Debüt „From Here We Go Sublime“. Gerade bei „Infinite Moment“ öffnete „das Verlassen des Studios neue Perspektiven bei der Schaffung neuer Musik“, und es war der Opener, „Made Of Steel. Made Of Stone“, der als erster fertig gestellt wurde und der ihn in den Fluss der Dinge brachte und den „Abschluss vom Rest des Albums leichter machte“. „Divide Now“ ist eine richtige Schallmitose, die die kommende Metamorphose in Angriff nimmt; wie eine Larve, die sich verpuppt und Wochen später unter der rauen Rinde in Form eines lebhaft gefärbten Schmetterlings wieder auftaucht – flatternde Breaks, die schließlich ihre Haut abwerfen und einem entscheidend intimeren und hypnotischeren zweiten Kapitel Platz machen. „Hear Your Voice“ treibt den üppigen, durch Pads gepolsterten Glamour seiner melodischen Lines durch den Mixer für eine kühnere synkopierte Version von Pop-Harmonien, die den 80er Jahre verpflichtet sind, während „Something Left, Something Right, Something Wrong“ zu einem flackernden post-euphorischen Dunst zurückkehrt. Die Beine sind taub, der Verstand verwirrt und die Augen verloren im großen Ganzen, wo entstehende Sterne im Rhythmus des Samba über die Milchstraße tanzen und die universelle Liebe keine Utopie ist.